I nearly forgot to include these. they're unnamed because they are going to a charity in Bend Oregon that distributes them to homeless folk. 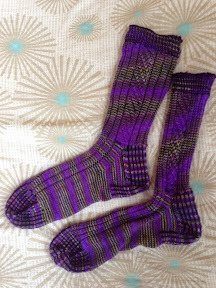 The winters can be very cold and I hope woolen socks will alleviate the cold in their feet. I hope the recipient enjoys the bright colour.